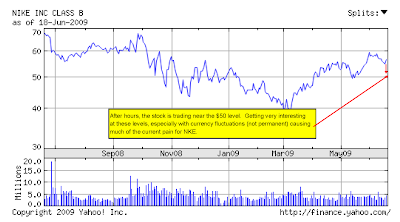 AlphaNinja - Nike (NKE) released earnings after the close. They beat earnings per share estimates by 3cents, and revenues were in line with expectations at about $4.7 billion for the 4th quarter ended May. -->>Sales were down 7%, hurt by currency exchange issues. -->>Gross margin down more than sales, (-12%). Nike cited "higher product input costs and product markdowns taken to manage inventories." 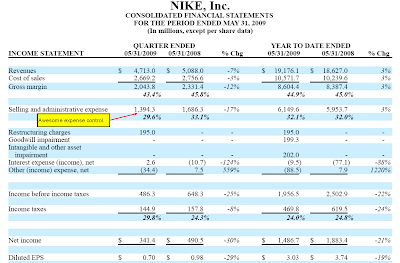 -->>Nike managed expenses very very well, as Selling & Administrative costs amounted to 29.6% of revenue, a big decrease from a year earlier. A breakdown by region - EMEA (Europe, Middle East & Africa) continues to be a sore spot. "The Company reported worldwide futures orders for Nike brand athletic footwear and apparel, scheduled for delivery from June 2009 through November 2009, totaling $7.8 billion, 12 percent lower than orders reported for the same period last year." In recent years Nike has usually surprised to the upside on futures orders, which give a "basic" look at what revenues might be in the next 6months. Down 12% does not hold up well with Q1's current street expectation of -6%, which is why the stock is off sharply after hours. Trading down 4% to near the $50 level, could be a great entry point. Conference call just started, I will update tonight/tomorrow.